Mixing stations for hot and cold water. Designed to thoroughly mix hot and cold water in any desired proportion. Available in both bronze and stainless steel. Mixing stations for steam and cold water. As an added safety measure, only sufficient water flow (5-6 GPM) can cause the steam valve to open, allowing steam and water to mix. 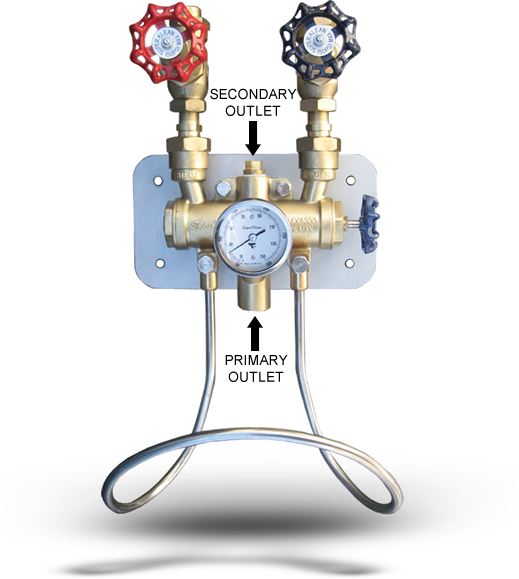 Superior thermostatic control. The unit’s accurate and solid, liquid-filled thermostat allows you to set the exact output water temperature desired from 80F to 160F. Your source for Washdown Stations, Hose Stations, Hot & Cold Water Mixing Stations, Steam & Cold Water Mixing Stations, Spray Nozzles, Spray Lances, Hoses & Hose Racks. Washdown Stations are used for numerous industrial and commercial applications in the refinery, chemical, petrochemical, oil/gas, mining, pulp and paper, polymer, pharmaceutical, food processing and service, beverage and dairy industries. Washdown Stations are widely used in dairy, pharmaceutical, food processing, chemical and industrial plants. Wherever efficient, economical and low-maintenance means of hot-water clean-up is needed, Washdown Stations are used. The most widely used cleaning method, the mop and bucket, risks cross-contamination. Hose reels and washdown stations assist in fighting bacteria and grime. However, without the right chemical mix and adequate water pressure, they can’t get the entire job done. They are an excellent sanitation solution for commercial and institutional facilities. When handling live steam, SAFETY COMES FIRST! To reduce the potential for steam discharge, all our steam and water mixers employ a safety technology. Steam is automatically blocked from discharging from the mixing station using a specially engineered diaphragm device. The diaphragm uses the steam supply pressure to positively close the steam inlet valve to the mixing chamber. Our mixers do not rely on potentially unreliable components such as temperature sensors or electrical devices to keep the steam valve closed. The diaphragm device will permit the steam inlet valve to open only after sufficient cold water flow is established by squeezing the spray nozzle or lance. If at any time the cold water is restricted, the steam is automatically shut off.